UPDATE: We now have all the official details of the camera. Everyone got pretty excited last week when IKEA announced that it will begin selling an all-in-one entertainment center with an HDTV and media player included in the set. But if this cardboard digital camera is any indication of what IKEA’s venture into selling electronics and gears is going to be like, we might be in for a big surprise. Shared by a press member of a recent event in Milan, IKEA gave out this cardboard disposable camera in its press kit to give attendees a preview of its next possible product. The camera uses two AA batteries and can store up to 40 pictures max. To upload the photos onto your computer, a USB stick swings out of the upper corner. Still, like most cameras, this camera is not to be dropped in water especially given its fragile body. While it is unclear what kinds of pictures this cardboard camera can take (or what crazy Swedish name it has), it is believed IKEA may be looking to sell it in retail stores, PetaPixel reports. If it does, hopefully it comes pre-assembled because nothing is less fun that gluing together a camera and waiting for the thing to dry before you can go out and have some fun. Since the camera is digital and not film, we’re giving it about 100 pictures before someone would actually wear the exterior out, or when the batteries die. It doesn’t look like they’re replaceable given the structure of that cardboard frame. We’re also not sure what one would consider buying an IKEA camera for especially since digital cameras these days are pretty portable and lightweight. 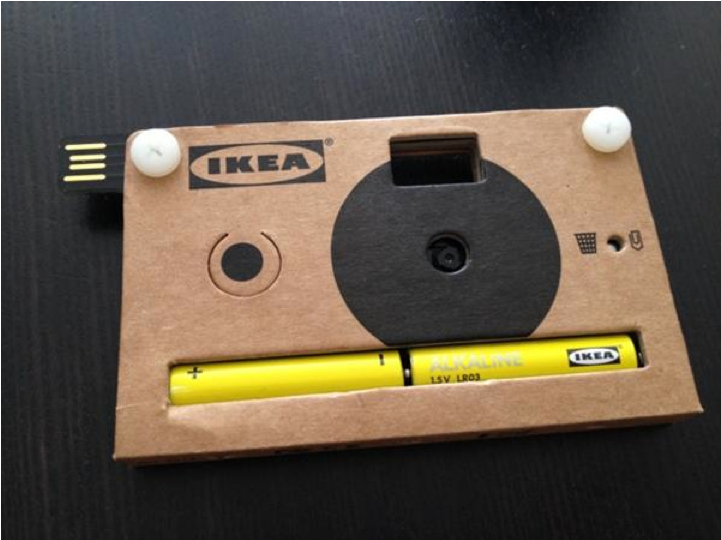 What do you think of IKEA’s cardboard digital camera? Are disposable cams making a comeback?